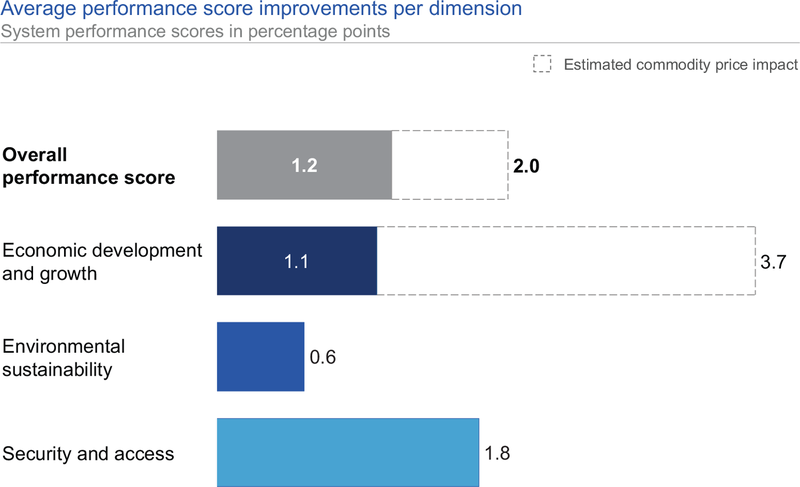 Globally, countries improved in all three dimensions of the triangle between 2013 and 2018. 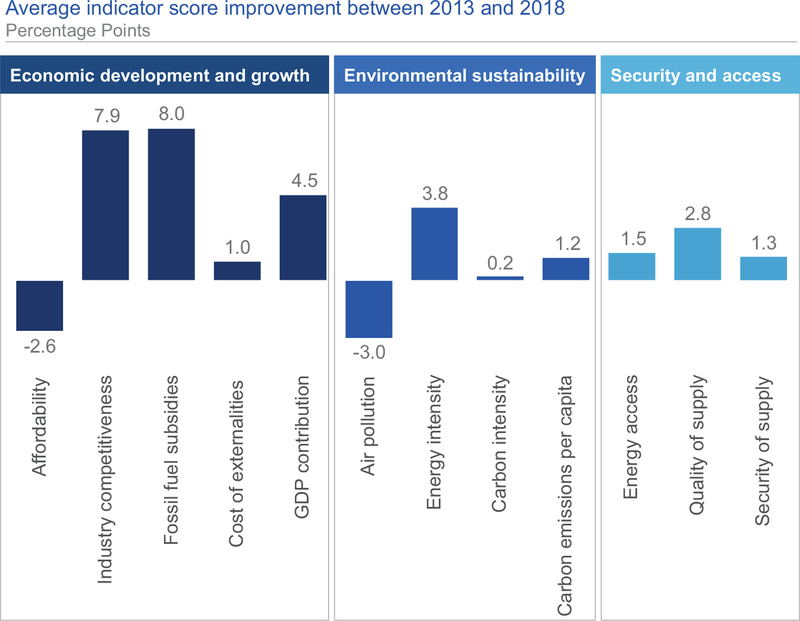 The improvement was primarily driven by higher performance in economic development and growth, followed by security and access, and environmental sustainability (Figure 5). On a more detailed level, improvement has had various causes, with 10 out of 12 indicator categories showing positive changes (Figure 6). Of the 114 countries covered in this index, 93 have experienced improved performance. Out of those 93, 45 countries have improved their energy systems in all three dimensions of the energy triangle. This indicates an overall positive trajectory. However, accelerated improvement is required to capture opportunities and address the challenges of energy transition. Progress in economic development and growth, the dimension with the biggest change, has been driven by fossil fuel subsidy removal. Countries in the third performance quartile48 showed the highest average improvement, which allowed them to narrow the gap with the top half of the ranking. Generally, countries benefitted from lower commodity prices, which can be described as non-structural improvement, driven by external factors. Assuming 2016 commodity prices for 2013, the improvement rate in the economic development and growth dimension would be smaller by two-thirds (Figure 5). Among the three dimensions of the triangle, environmental sustainability poses the biggest challenges, with the lowest performance and improvement rates. The numbers indicate a complex journey towards an energy system that supports the targets of local air pollution and greenhouse gas emissions in line with the Paris Agreement. Between 2013 and 2018, 45 countries saw decreasing scores in this dimension. Also, air pollution remains a major challenge, with PM2.5 emissions worsening for 67 countries, causing around 6 million premature deaths per year globally.51 Carbon intensity scores stayed flat and even countries in the top performance quartile have potential for further improvement. Progress in environmental sustainability has been more challenging to achieve among the three imperatives, so it is important to learn how to improve within this dimension. The following analysis focuses on how to foster more effective carbon emission reductions in the energy system. The carbon intensity of energy systems around the world varies depending on the nature of primary energy supply, economic activity, climate, etc., and ranges from coal-heavy energy systems to systems with a mainly low-carbon energy supply.57 The sectorial breakdown of carbon emissions also varies widely among countries. For instance, with a carbon-free electricity system, Paraguay’s carbon emissions are almost exclusively from transport (>90%), while over two-thirds of Estonia and Bahrain’s carbon emissions are from electricity and heat generation. China and Vietnam have a relatively high share of emissions from industry (>30%), while a comparatively large share of Switzerland and France’s emissions are from residential and public buildings (>30%). Japan, with comparatively high carbon emissions from the power sector, is pursuing another strategy to reduce emissions. It plans to make hydrogen fuel (expected to be produced from clean energy in the long run) a pillar of its energy system. A potential additional benefit would be the reduction of import dependency (if produced domestically) and the diversification of supply risks. An assessment of global carbon emissions between 2010 and 2014 shows that simultaneously improving along all sectors of the economy is challenging. Less than 10% of countries reduced carbon emissions while increasing their economic output during that period. The decarbonization of power and reduction of emissions from the residential sector were the largest improvement drivers for countries with the highest carbon emissions improvement rates between 2010 and 2014.62 These countries rank in the top half of the ETI, and six of them show top quartile readiness scores. Electricity systems progressed on decarbonization in the same period, with more than 60% of countries improving the carbon intensity of electricity and heat generation. With renewable-power generation-capacity additions exceeding conventional generation since then,63 further decarbonization of the power sector is expected. 48 Quartiles are defined as: first (75th to top), second (50th to 75th), third (25th to 50th), fourth (bottom to 25th). 49 Sustainable Energy for All, see http://www.se4all.org/our-mission. 50 Average score of countries in the top performance quartile: 84%; average score in the bottom performance quartile: 40%. 51 International Energy Agency, World Energy Outlook 2017, November 2017, available at http://www.iea.org/media/workshops/2017/cop23/presentations/16NovWEOSDSGuel.pdf. 52 Energy Transitions Commission, “Better Energy, Greater Prosperity”, available at http://www.energy-transitions.org/better-energy-greater-prosperity. 53 Estimates suggest that energy ef ciency investment would need to increase by a factor of 3-6 from current levels of $250 billion a year to reach the 2030 objective; The Beam, “5 Things We Learned From The Newly Updated ‘Heat Maps’ Developed By Sustainable Energy For All”, September 2017, available at https://cleantechnica.com/2017/09/21/5-things-learned-newly-updated-heat-maps-developed-sustainable-energy/. 54 BP, “BP Statistical Review of World Energy”, June 2017, available at http://www.bp.com/content/dam/bp/en/corporate/pdf/energy-economics/statistical-review-2017/bp-statistical-review-of-world-energy-2017-full-report.pdf . 55 International Energy Agency, CO2 emissions from fuel combustion: Overview (2017 edition), available at https://www.iea.org/publications/freepublications/publication/CO2EmissionsFromFuelCombustion2017Overview.pdf. 56 Emissions from electricity are all allocated to heat and electricity and not the end consumer. 57 Examples for coal-heavy systems are China and Mongolia with >70 kg CO2 per gigajoule (GJ) of primary energy consumed. Examples of low-carbon intensive energy systems are Switzerland, Norway, France, Iceland and several Sub-Saharan African countries. 58 Energy Transitions Commission, “Better Energy, Greater Prosperity”. 62 Only countries with >10 metric tons CO2 emissions were included in the analysis. 64 Between 2010 and 2014, the United States reduced carbon emissions from fuel combustion by 170 million tons.